Folder Hidden is a free hiding tool which ensures secure and faster way to conceal your personal data from others. It quickly hides files and folders in local partitions as well as removable devices. The data can be disclosed only when you present a valid password for the application. As the data is concealed, other programs or operating systems can’t perceive it. Folder Hidden is strictly for home users only, and is not recommended for commercial purposes where more secrecy is required. 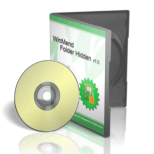 Folder Hidden 2.2 is the latest version which is developed by ‘WinMend’ systems. The main intention behind developing this tool is to ensure complete privacy when share your computer with multiple users. The new version has added a function for automatic update. Safe and Reliable – The technology used for hiding will in no way damage your data. Instant hiding with high speed whether you have GB’s of data or a folder consisting a lot of files. Supports Removable drives – The files and folders can be made invisible on USB or flash drives which are removable from the computer. Drag and Drop facility to import files and folders using the file browser. Sort the files and folders according to name or status. It sports a clean and intuitive user interface, where you can configure options according to your needs. It is mandatory to set a password when you first time initialize the software, which can be changed later. You can import files and folders by dragging them to the application using the file browser. To hide files/folders, simply press the “Set to hide” button and the status would be changed from “visible” to “hidden” in the list. You can unhide them anytime you want with a valid password. You can refresh the list, change the interface language, color and password. The application takes up very little system resources and the main loophole in the application is when you change your password, it will not ask for the old one which is a prerequisite. And, because of that anyone can change your password and access if you leave the application open. Overall, WinMend Folder Hidden 2.2 is a great tool for user identity and privacy except the fact that it doesn’t ask for the old password, when you are setting a new password. 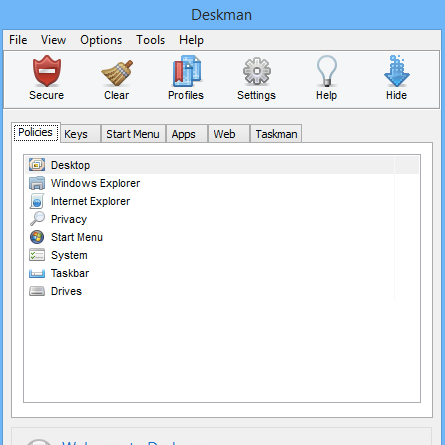 Deskman 15 is an advanced security solution for desktop administrators and power users, which can create secure desktops, restrict application handling, and lock computers as well. With Deskman, the administrators can achieve the desired level of security with the customized restrictions and options available in the tool. The restrictions include Freeze, Safe Start Menu, Autorun Options, Desktop Lockdown, and stopping others from accessing the user security profiles. This is an excellent desktop security manager for Windows operating systems, where experienced people can administer security all through their computer. The user can even include user groups or individual users in the exception list. The tool enables you to stop particular keyboard shortcuts and mouse gestures. It allows you to terminate apps that are installed on your system. Although, Deskman is intuitive and developed mainly for administrators and experienced, novice users may find it difficult to work with, because of the language present in the program. Below the menu bar, the interface includes some shortcuts such as Secure, Clear, Profiles, Settings, Help, and Hide for performing tasks faster. You can customize options by selecting the restrictions you want to apply for Desktop and System related tools. 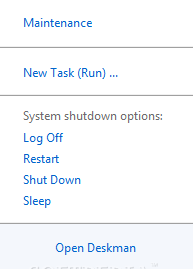 You could deactivate various key and mouse actions, start menu options, Apps, and Web options. You can create a new task by typing the name of a program, document, or resource, to be executed. One-Button Security – Lock down workstations the way you wish. Kiosk Mode – Lock down desktops, allowing only the apps you want. Maintenance Mode – Remove restrictions when needed. You can have a lot of restrictions for System Policies, Start Menu, Apps, Web, etc. Block applications that are meant to damage your secure environment by allowing only a list of programs. It provides Safe Web Browsing that block websites, with your exemptions. Disable USB drives and added reboot adviser icon in the status bar. With Deskman, the advanced setup options include user exceptions, autologon, silent installation available, user profiles for fast deployment, import/export data file, tight hotkey and password security system without any internet connection. The new version Deskman 15 has fixed startup bug in 32-bit systems, added Deskman process shielding, and fixed other minor changes. Deskman is available in two different editions – Classic and Network. With “Deskman Network”, you could protect multiple PCs or workstations in your organization and is accessible via web. Download the desired version that best suits your needs.